Looking for the best domain generators for your new blog, or want a cool creative domain name for your company and run out of the ideas? Your domain name is the equivalent of your Internet ID, and you want it to be presentable. So let’s make sure it is. Get creative domain name ideas with the help of the best domain generators. Why did Creativity need for A Domain? A good and Creative domain name can help you build a brand that people will remember and keep coming back to. Whether you are in a need of a domain name for your personal web presence, your company’s website or your local community, your URL is very often the very first message you send to your visitors. That is why choosing a perfect domain name can be one of the most challenging aspects of building your personal or corporate brand. You have spent hours, or days, trying to come up with that perfect URL for your next product, Company or Brand Website coming up with a name just to realize it is already registered by someone else.? This is where domain name generators often come in. Boost your inspiration with suggestions generated by an intelligent naming tools. Your search for best domain generator ends here because I have listed some of the best brand name generators in this article. When I was new in the blogging era, I have spent hours a day to find a domain name for my blogs. I have lost one of my favorite domain because that time I was not had much money to renew the domain name. After losing the domain I have decided to keep my domains secure from the domain catchers and here is the surprise I have 10 to 20 Brand domains, as if you are a regular follower of my social profile, You may be aware of some of the Branded domain names in my collection. In the web, there are several domain name generators which will help you best suitable name available for you. Here is best domain name generator picked by me. Wordoid is the most creative way to find a catchy name for your new venture. I have used Wordoid to register quite a few creative domain names in the past. This gem lets you mesh words in different languages including English, Spanish, French, Italian, and German of TLD .com or .net. The system also has a quality system that makes words sound natural and more relatable to the selected language, giving it a better sound and feel as a result. You can select for a word to start, contain, or end with a certain fragment, providing a result that closely matches your website’s description. Perhaps the most useful part is the website’s ability to tell you whether the word is already registered as a domain name – all from one convenient place. A Gold Mine for great Domain Names that’s completely free. Flame Domain provides the best Domain Name Generator & Brand Name Generator out there! You can Check the domain availability of .com and .net or both across the best domain registrars. You can also specify the result according to your domain type or the niche you want to work on. I am using it from few months and this is a really awesome tool to find branded and creative domains. You can Join it for free or can be a pro member if you want something more awesomeness and be a premium domain seller. Lean Domain Search acquired by company Automattic, the parent company of WordPress, so it was naturally the first tool I tested, and it set the bar extremely high for all of the other tools that followed. The engine shows you the list of available domains with the saying you entered having a huge number of suggestions so for the phrase “recipes” you get 733 benefits, all domains having your .com extension. The email address particulars are categorized after colors: green meaning actually available for registration, red which has been already registered and yellow include the favorite’s ones. You can mark a domain as being a favorite one and you’ll check its availability instantly while using availability checker tool through the website. Another bonus of using Lean Domain Search is that you can browse the list of suggestions on your web page, or you can copy the entire list to your clipboard with the click of a button and paste it into a document to come back to later. NameMesh offers you so much versatility that you may get completely confused. It Works well when you have several keywords in mind. Choose 2-3 keywords, and enter them into the search box. Then, generate your list! 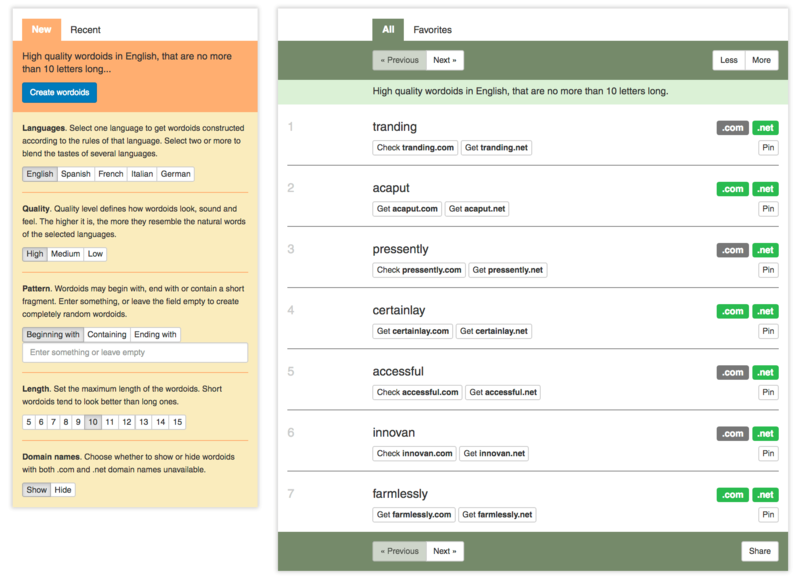 This generator breaks results into eight categories: common, similar, new, SEO, short, fun, extra, and mix. You can then filter them more based on domain extension, availability, and maximum length. Domainr is slightly different to the other tools I came across, but it’s twisted on the domain generator concept got my attention right away. Doesn’t offer suggestions for related words and a pile of possible domain name options, but it does offer suggestions for domain extensions that can be used to give you a shorter domain, and a point of difference. Integrating your domain extension into your name isn’t for everyone, but could be a good option to check out if you’re looking for something a little different – particularly if you’re working in the tech and innovation industries. Domainr anonymously logs searches and tracks over 1,726 top-level domains and over 895 pending generic TLDs, registrable at one of 222 accredited registrars. There are two external APIs for web services and client-side implementations. There are some more domain name generators are DomainWheel, Nameboy or Panabee. Don’t get confused with more domain generator list so I have listed only the best and top domain generators. Tip:Choose two words that are descriptive and interesting. This can be as subtle as your name. If it’s a personal blog try to use the first+last name like aryanraj, or a mashup of two words that relate to your content, if it’s more of a topical blog (e.g. Wikipedia, FaceBook, etc.). I am creative, I have some domain generator ideas to come up with a great domain. Choosing your Brand domain isn’t easy, but with the help of these brand name generators, you’ll have the tool you need to find inspiration and a domain to fit with your vision. 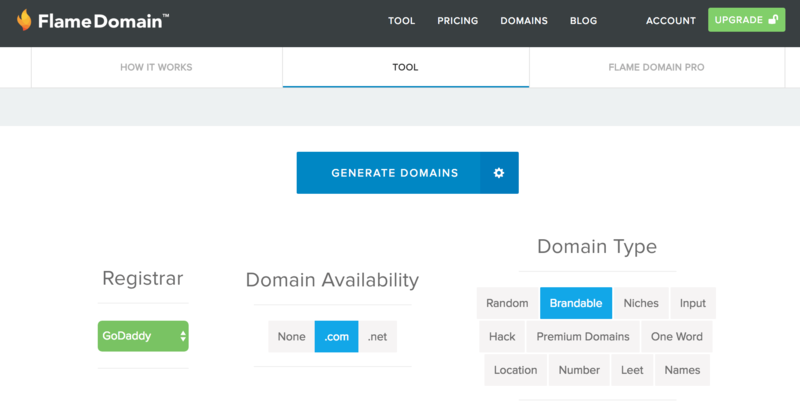 Which domain generator is your favorite? Let us know in the comments! Informative list of tools for new domain’s ideas. I was just came to know about wordoid and flame domain.